Why it matters: Despite a few drawbacks, Intel continues to dominate the world of high performance processors, on PCs and in the server market. AMD is a true challenger, but perhaps the biggest threat the company faces is in the mobile and low-power segment, a market they were never able to penetrate. Conversely, Qualcomm's ARM-based chips dominate the mobile space and for quite sometime they've been wanting to go further, challenging Intel in tablets and laptops that increasingly require desktop-class performance but never at the cost of power efficiency. During the last day of the Snapdragon Tech Summit, Qualcomm announced the Snapdragon 8cx, the company's third compute chipset and the first 7nm platform built for PCs. Qualcomm's pitch is about "always on, always connected" PCs (we touched on this subject this week, see Bob's column) or laptops that act more like smartphones: fanless, instant on, with continuous connectivity via LTE, and multi-day battery life. The 8cx is the largest processor the company has ever made, with eight custom processing cores that make up the Kryo 495 CPU: four high performance Cortex-A76 cores and four low-power Cortex-A55 cores that are higher clocked than the previously announced Snapdragon 850. The Snapdragon 8cx is equipped with 10 MB of combined cache with support for up to 16GB RAM, NVMe and UFS3.0 storage. Qualcomm's presentation was loose on details about peak performance throughput. Not surprising, since their chips are not known for throttling as fast as Intel's. However the comparison was centered around performance when sustaining 7W of power. In that scenario Qualcomm claims the Snapdragon 8cx is four times as fast as Intel's low-power fanless Y-series processors, and twice as fast as Intel U-series CPUs, again, at sustained non-peak performance. 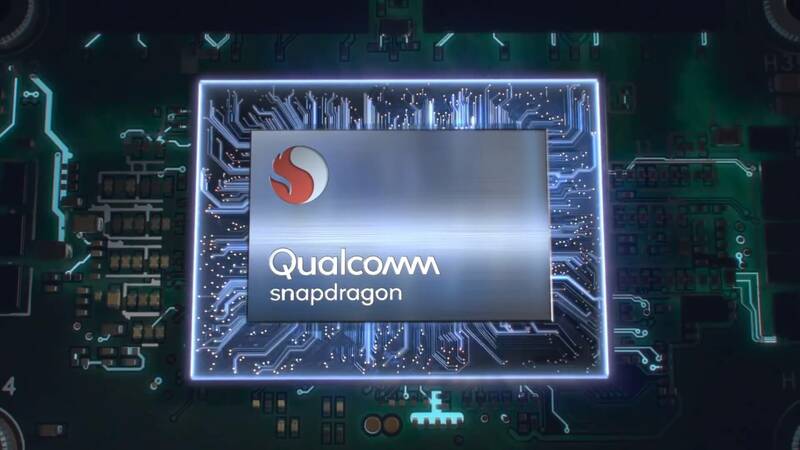 The Snapdragon 8cx remains an SoC, so it integrates other components like the Adreno 680 GPU, Hexagon 690 DSP, advanced image processing, I/O, Wi-Fi, Bluetooth and the Snapdragon X24 modem, a flagship Qualcomm component that is the first to support Category 20 2 Gbps LTE. On the graphics side, the integrated Adreno 680 GPU is said to be 3.5 times faster than the Snapdragon 835 and twice as fast as the GPU in their newest mobile Snapdragon 855 SoC thanks to twice the transistors and twice the memory bandwidth. It also brings support for up to two 4K displays at 60 Hz. In other words, Qualcomm isn’t slowing down in their pursuit of challenging Intel. A few months back we tested their first major attempt at a Snapdragon-based laptop, but the result was not great. Windows on ARM running on a Snapdragon 835, the same system-on-a-chip used by many of 2017’s flagship Android smartphones, posed an interesting discussion with some benefits, but the performance of emulating the x86 engine was disappointing to say the least. Remember that Windows on ARM only runs UWP apps and the Edge browser natively. The rest of x86 programs (most regular software) rely on a x86 emulation engine that can use further refinements for improved performance and 64-bit compatibility. The improvements can also come from much faster silicon, and that's where the Snapdragon 8cx comes in. Also on the software front, with Edge soon becoming a Google Chrome equivalent, it does present a more interesting proposition. The first Snapdragon 8cx machines are expected to hit the market on Q3/2019.